This four-bedroom, four-bath home on the Peninsula's Seaside Walk is listed at $5,299,900. Courtesy photo. If only for the fact that they’re all above water right now, there’s never been a better time to buy a home on Long Beach’s Peninsula. Despite reports that the beautiful and charming seaside community will some day, perhaps relatively soon, sleep with the fishes, luxury homes on the spit of land between Alamitos Bay and the Pacific Ocean, are still in demand at ever-escalating prices. Right now there are three Peninsula homes listed for more than $5 million, including a couple that just recently hit the market. One is a $5.9 million overbuilt hulking monster on 60th Place, another is a similarly over-the-top extravaganza at 6717 Seaside Walk offered at a budget-annihilating $6,188,888 by sellers who apparently believe in the good fortunes brought about by the lucky number 8. 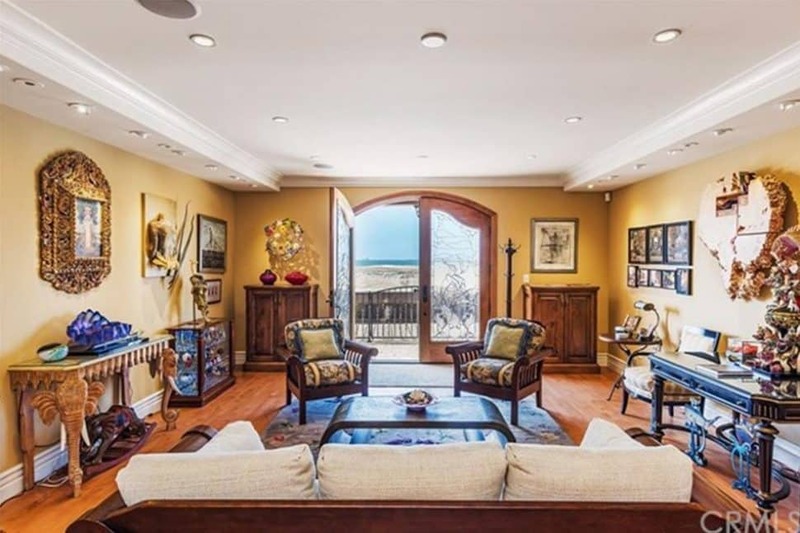 Interior of a $6,188,888 beachfront home on the Peninsula’s Seaside Walk. Courtesy photo. The third is the one we’re looking at today, the “cheapest” of the three, is on the beach at 6411 Seaside Walk. It’s not as opulent as the other two, which is why we like it more; it fits in nicely in the seaside neighborhood. And, while it’s too well-appointed to qualify as a surf shack, it still maintains the beach vibe for which the Peninsula is famous and beloved. The four-bedroom, four-bath home was built in 1950, though a time-traveler from that year wouldn’t recognize it today after a pair of extensive renovations made to the house over its 70 years. Backyard? On the Peninsula, where space is way too valuable to squander it on flowers and grass? “Yes,” confirmed Kostos. “Yards on the Peninsula are extremely rare.” And this one’s big enough that the owners have put a basketball hoop in, though an airball could do some serious havoc to the surrounding patio and guests. The house is listed for $5,299,900; that’s a big-ticket item at $1,469 per square foot. Great. I can spring for a dozen, which should cover the cost of a strip of drought-tolerant plants running along part of the house’s front on the plankwood boardwalk. View from the loggia at 6411 Seaside Walk on the Peninsula. Courtesy photo. The home doesn’t waste residents’ or guests’ time with interior decoration or a tour; visitors are hauled right out to the sea, visible from every bedroom, balcony and patio with views that are described as limitless, but they do, in fact, end at the horizon. Once you grow bored by the panoramic vista—and that could take awhile—there is more to see in the two-story home that, despite the current owners throwing another batch of cash at the house to give it a more contemporary feel after the previous owners went for the beach-shack look, still has an inescapable seashore ambience. That’s thanks to its white, open-beam ceilings, a near over-abundance of windows and plenty of places to sit back and enjoy the view, from patio arrangements to dining areas, to window seats and, most of all, from a cozy loggia equipped with a kegerator, refrigerator, outdoor fireplace, fountain and, if you’re in a sporting mood, perhaps a game of H-O-R-S-E on the aforementioned basketball setup. Other amenities include motorized blinds, a six-burner Wolf range, Subzero refrigerator and a climate-controlled 1,000-bottle wine cellar. Beach houses going for well into the seven figures aside, Kostos and other Realtors insist that waterfront homes in Long Beach remain a great bargain relative to other coastline cities. “Long Beach is the best-kept secret,” Kostos said, making it less so. And to further spill the beans, her company is advertising this house both nationally and internationally. Whether they’re climate-change deniers or just folks who live for today, a lot of people from out of state are looking at the Peninsula, said Kostos, who specializes in beach-city properties.